Long Beach, CA - September 23, 2018 – Universal Avionics (UA) announces the 60th Embraer-140/145 aircraft completion in Envoy Air's WAAS/SBAS-FMS upgrade program. The upgrade program includes 169 aircraft, all of which will be retrofitted with dual UA UNS-1Lw FMSs, providing Envoy Air with a navigation source for ADS-B Out and the latest in capabilities and operational efficiencies. "UA's FMS was a factory option for the Embraer 140/145 and integrates easily into the original aircraft configuration," said Robert Kline, UA Airline Sales Manager for the U.S. "Envoy considered a number of options and found that the upgrade of the existing aircraft avionics was the most efficient, and opened the door for further precision navigation capabilities," he added. "Our logistics and technical support were an important element for successfully completing the modification program on time." 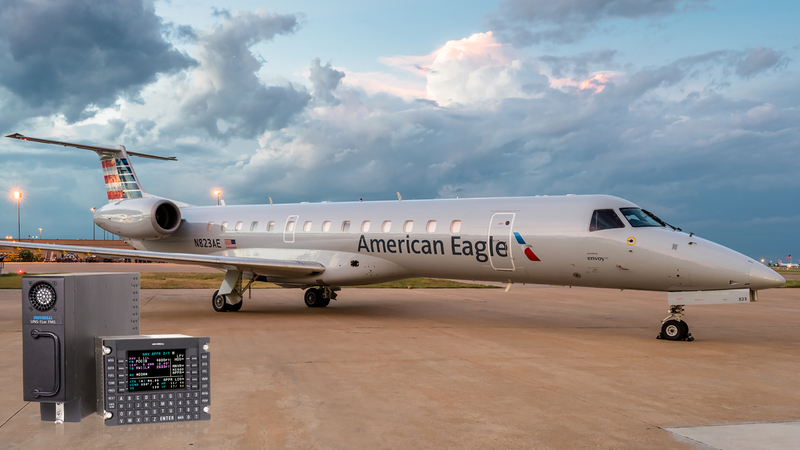 "We were working to solve several issues with our fleet of Embraer 140 and 145 aircraft, to meet the regulatory requirements of ADS-B Out," said Jim Burden, Managing Director Technical Services at Envoy Air. "Replacing the legacy UA UNS-1K FMSs that were originally installed in 1998 with the new UNS-1Lw's allowed us to resolve all of these issues and has provided us with a platform for future navigational improvements, such as LPV," he added.